Ubisoft recently boasted about the latest in its music-rhythm franchise – Just Dance 2 – passing another sales milestone. The Wii-exclusive sequel has sold more than 5 million units since its October, 2010 launch, putting franchise sales over 10 million across 3 titles (Just Dance 1, 2, Kids). “The Just Dance franchise has revitalized the video game music category with consumers worldwide joining the dance movement. Players of all ages are enjoying the social and physical benefits of playing Just Dance 2 as it’s truly a game that is accessible and enjoyable for everyone,” said Tony Key, SVP of Sales & Marketing at Ubisoft North America. “When you have the ultimate social game, word travels fast — word of mouth has been extremely effective in making Just Dance 2 a blockbuster hit this holiday,” Key added. 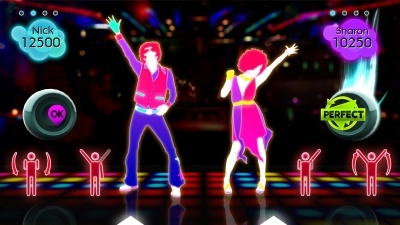 “The strong performance of Just Dance 2 is a perfect example of the potential that can be achieved by an independent publisher like Ubisoft in delivering irresistible content for the Wii system,” said Nintendo of America President Reggie Fils-Aime.